Our contractor hired for the project is highly skilled in mobile app development. We were tasked with creating a digital historical catalogue for historical sites, stories, and trails throughout Virginia. Adding more than 400 sites into our content management system was time consuming and required an eye for detail. But the biggest challenge was creating an Android-friendly build with the same features contained in our iPhone version. Kathy J. Spangler is the Executive Director of 'Virginia’s 2019 Commemoration, American Evolution'. The 2019 Commemoration marks the 400th anniversary of four landmark events in 1619, which set Virginia and America on a course towards the ideals of Democracy, Diversity and Opportunity. As the Executive Director, Ms. Spangler serves as principal liaison to the 2019 Commemoration Steering Committee. 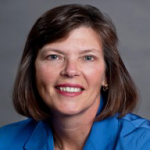 She is a nationally recognized leader with more than 35 years of experience in public and non-profit management. Ms. Spangler most recently served as vice president of 'Save the Children' from 2010-2015 in Washington, D.C. During her time at 'Save the Children', Ms. Spangler led the organization’s U.S. programs, including Head Start. She served in several executive roles from 2007 to 2010 at 'America’s Promise Alliance', where she oversaw the 100 Best Communities for Young People national recognition program. Additionally, Ms. Spangler served four years as the founding director of the National Partnerships, capping her 20-year tenure, from 1987-2007, at the 'National Recreation and Park Association'. She worked as a recreation supervisor and coordinator in New Hampshire from 1979 to 1987. Ms. Spangler earned a bachelor’s degree from the 'University of Maine' and achieved the Certified Association Executive credential. She has received numerous awards, including an honorary doctoral degree in 2003 from the 'University of Maine'. My favorite apps tend to serve a clear function, whether helping me get somewhere, involve learning, or facilitate everyday life. I especially appreciate easy-to-use travel and history apps that feature a clean design. 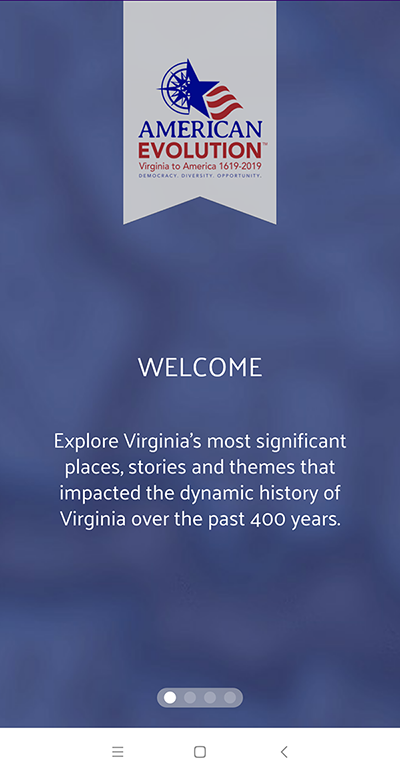 My app preferences of course had an influence on the conceptualization of our 'Virginia History Trails' app! 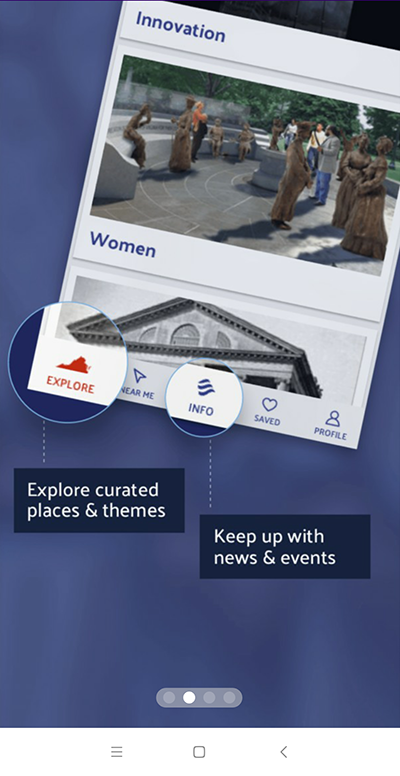 We started the conceptualization phase in 2016, and partnered with the 'Library of Virginia' and 'Virginia Humanities' to curate the app content. Once we had the content established, we started working with 'Hothouse' for the design and build starting in July of 2017. Coding began shortly after and we launched the app in May 2018. Regular updates to the content have been made on an ongoing basis since then. When developing this app, the overarching goal we had in mind was to provide users with an interactive, educational experience to facilitate the exploration of Virginia, whether the users be locals or from out-of-state. Our interface was designed to allow for location-based experience suggestions, or an easy learning tool sorted by historical topics. 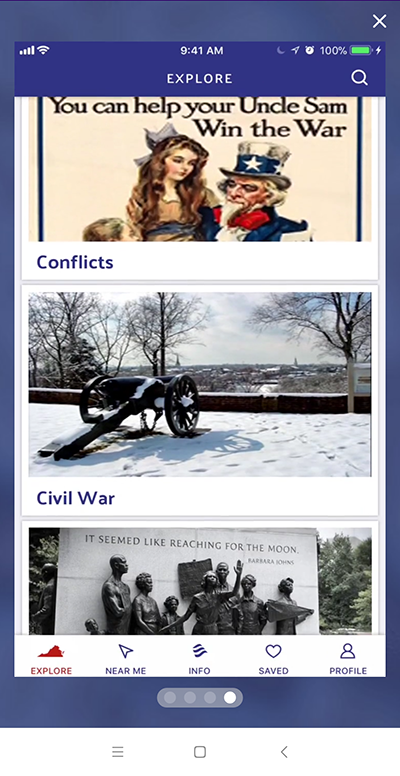 The 'Virginia History Trails' app blends learning and adventure into one easy-to-use platform. Using a location-based map service, users can find stories of interest nearby or in a specific area, and plan their routes accordingly. The platform adds a competitive edge with a badge system, rewarding users for their travels to each site. Finally, the app is a one-stop-shop for those who wish to learn about Virginia. They can view upcoming events, see top headlines, and visit the many historical sites across the Commonwealth. I’m very proud to say our app has won multiple awards including Best Mobile App Awards’ Gold Award for Best New Mobile App in August 2018, and it won the Excellence in Immersive Experience award from the 11th annual Media Excellence Awards in 2019. Our forthcoming updates will include refinement of the "Events" page view to allow for more flexibility in the date range field. We continue to update the featured news to keep our users updated, and we are relaunching the app this spring with a contest! New users can download the app today for free on both 'Google Play' and the 'App Store'! Sign up to start checking in to your favorite Virginia sites and share your progress on social media using #VAHistoryTrails. About App: Discover why Virginia is for history lovers. Explore over 400 of the most impactful people, places and events that shaped Virginia and that are continuing to influence America today. American Evolution: Virginia to America 1619-2019 commemorates landmark events that helped shape the country. Join the commemoration and take a historic tour with ties to the present. 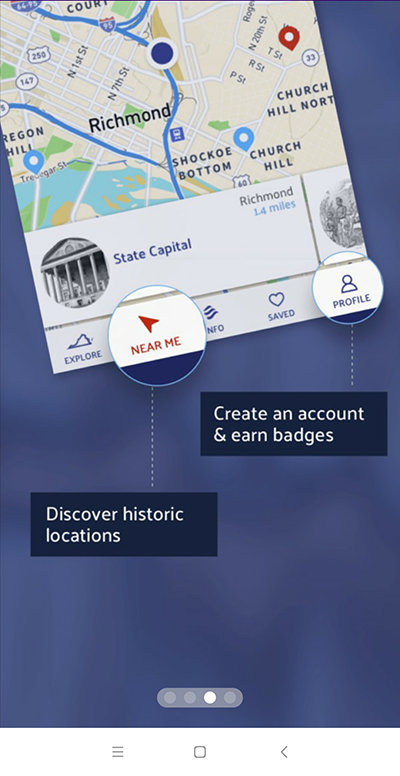 Collect badges as you tour the places in Virginia where important historical events took place. Tour with your friends and see who can acquire the first gold badge in your region, or tour specific themes and trails for more badges, then share on social media. Explore where to go and learn more about what interests you. Search destinations by region, or discover whole trails - a group of sites that are connected to a central idea like civil rights, women, innovation, culture, and more. Find destinations near you: filter the locations by topic, region, proximity and more, search by keywords, or view the map. Stay up to date on the latest news and event information around the American Evolution. Save your favorite stories so you can tour them later.